The CEAA is planning to host several annual events such as a golf weekends, hockey games, ski trips, and alumni nights. If you are a Eagles hockey alumnus, please Join Us on this website and fill out all applicable areas with all your current information to have your name added to our database. We will send you information on upcoming Eagles Alumni activities. 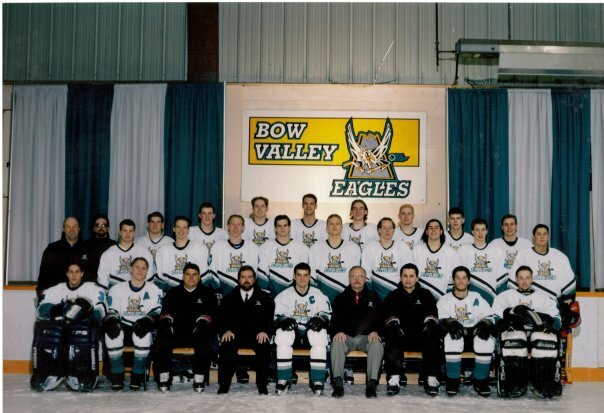 The Canmore Eagles Alumni Association (CEAA) was recently formed to provide an opportunity for past players to reunite on an annual basis to reminisce about their experience with the eagles and to catch up on life's current endeavor's. We will also focus on giving back to the program and how we can contribute the the teams success on and off the ice. The goal of the CEAA is to ensure that Canmore Eagles Hockey Program is recognized as a first class organization. We will strive to achieve this through innovative strategies, the spirit and integrity of our team, and the dedicated efforts of our valued alumni members. The CEAA will continue building our programs, contributions and awareness. We are proud to be a part of a great organization and community and look forward to contributing to our future success. We envision an extremely bright future for the Canmore Eagles Alumni Association, which we plan to achieve through commitment, participation and growth of our memberships. We encourage past players to get involved with your Alumni and fans to come out and enjoy some great entertainment.